What prompted this latest piece? I wanted to go back to the studio and make work. I hadn’t done that for a while! What kind of environments did you need to establish to develop this work? I really wanted time to work and research ideas and texts, visual and written, that dealt with the idea of “paradise is elsewhere.” I started out working with this idea of the “ethnographic other” so prevalent in early representations of the Americas. I wanted to see how I could develop another perspective than the one George and I created with The Architecture of Seeing. I was teaching at Princeton last year and was able to get research funds to do exactly that. Is there a specific take on academia that you employed? I have always lived vicariously through academic friends discussing ideas that somehow applied to making dances and then years ago when I started developing this course “bodies in cultural landscape” that I have adapted to the seminar course I teach at Hunter. I realized that I was engaged by teaching in a similar way to how I am engaged when I perform. But the idea of “lecturing” was always a kind of complicated question for me. As a dancer we are usually not educated in the dialectics of ideas, at least not in dance departments, as a lot of the time is dedicated to the accomplishment of technical control and physical virtuosity. But when I realized I could actually have lots of discussing and have that be the main drive informing the students’ work, I was sold. The physical practice became more intertwined with the philosophical kinesthetics of the mind…and this is all without becoming overly theoretical. The movement is clearly coming out of each student’s experience. Clearly the work is for the classroom for now, not the street, the gallery or the stage, but I have learned so much in the last 10 years with my teaching of these more theoretical texts. So yes, long answer short- I took this idea of a performative lecture that is at the center of this piece from my years of teaching. Is there something about cultural difference that excites you or challenges you? What do you think about passion? That is so funny you ask. Yvonne Rainer does this most brilliant lecture about “Passion” now when we go on tour. It’s called “Where is the Passion?” and no one is better than her to talk about what’s up with PASSION….but I would always bring it up to her because when I show Trio A, at Hunter and elsewhere, some students ask me “Where is the passion?? ?” They get totally freaked out that Trio A expresses passion differently than say, Ailey’s “Cry, ” not that they only understand that kind of “passion” but that they are mostly only exposed to a very specific kind of “Passion.” But I was so happy last semester when at Hunter one student said that the passion in Trio A was clearly expressed in the fact that this dancer on the tape (Rainer herself) was constantly shifting focal points and that to him expressed a kind of insecure confidence in a passionate pursuit… Yes…passion, maybe that is now what Trajal is calling “certain joys” in his curatorial title for the Platform Series that Para-dice is a part of. Joy is passionate, I am invested in finding joy as in laughter and irony..a deeper kind of joy..It would be great if the idea of “passion” was stretched to include more than only certain prescribed states of mind and body. I cannot create anything in isolation. The basics of everything I do is collaboration. 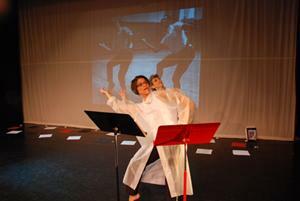 I collaborated with Peggy Gould to create this duet in Para-dice for her and I during a year plus. I might have some clear idea about something but I always need to know if its working with the other people too and how else we could do that same idea. I just made a piece for the NYU 2nd Ave Dance Company and I had a great time collaborating with the dancers. I remember when I was in that company during my senior year at NYU more than 2 decades ago and the choreographers that came to work with us were very clear that we were not worth a dialogue, an exchange with, and they “set” some piece “on” us. I learned nothing from that experience…just a kind of strange humiliation. But this time at NYU I really was so into working with the dancers and getting to know who they were. I could only do that if I was interested in collaborating with them. I am much much older..hahahahh! I have worked through every injury and I know my body better now. I know how to be more economical and I am not as provoked by things around me…although i can still work on that for the rest of my life. I can concentrate quicker, I know how I feel quicker and I can better articulate what is going on around and inside of me quicker. I am still interested in similar projects, I am still wondering how to mold different languages into a convoluted whole. I remember when I auditioned for Fresh Tracks in 1986 and David White left this message on my machine saying how messy and disorganized the work was and that yes, the panel was taking the piece but only if I was willing to clean it up…yes, I am still interested in creating chaotic work that doesn’t feel artificial and superficial.